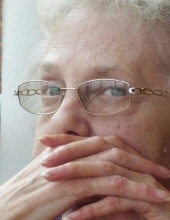 Kay L. Dempsey, age 71, of Onaway, died on Saturday January 12, 2019 at McLaren Northern Michigan Hospital in Petoskey. Born in Alpena on April 12, 1947, Kay was the daughter of Arnon and Ethyle (Crooks) Kirkendall. Kay was a homemaker and worked at Essex Wire in Atlanta before taking a job in the bakery at the B & C Grocery Store in Onaway. This job suited Kay well, as she was an excellent baker and talented cake decorator, with her forte being wedding cakes. More than forty years passed, the B & C became Country Star Market, then Carter’s IGA, and eventually Tom’s Family Market, before Kay retired. She always had a smile and a cheerful greeting for the customers. Sometimes she could be seen dancing and singing as she stocked shelves and was always fun to work with. Through the years she made many good friends at the store. A skilled seamstress and quilter, Kay sewed clothing for her daughters when they were little girls with matching outfits for their dolls. She also enjoyed knitting, painting, and crafting. As a 4-H leader, she shared her creative skills with the youth in the community, teaching sewing, cake decorating, and wildflowers. She loved solving crossword puzzles and would spend hours putting puzzles together. A lifelong resident of the Onaway area, Kay knew all the best places for picking huckleberries, blackberries, and raspberries. She loved feeding the birds, always excited when she had cardinals at the feeder. Kay was fiercely independent, feisty, and had a huge heart. She would help anyone, never expecting anything in return. With her friendly disposition, she was well-liked and seemed to know everyone in the community. She valued her family and loved the special bond she shared with her daughters and grandchildren. Not a day went by that she didn’t see them or talk with them. This sassy, fun-loving lady with her warm heart and beautiful smile will be sadly missed but will live on in our hearts. Surviving Kay are her two daughters, Lisa (Bob) Pochmara of Millersburg and Kristine Dempsey (Gary Loftin) of Onaway; the three grandchildren she adored, Tyler Odle of Onaway and KayAnna and Kaden Dean, both of Millersburg; aunt, Jean Arnold of Leesburg; step-children, Laura (Noble) Hughes of Edwardsburg, Fred Dempsey of Onaway, and Dan (Dottie) Dempsey of Dowagiac; as well as step-grandchildren, nieces, and nephews. Kay was preceded in death by her parents; an infant daughter, Kayleen; husband, Fred Dempsey; sister, Paula LeCureux, brother, Jerry Kirkendall, and niece, Christyn Painter. Visitation will be at the Chagnon Funeral Home from 4 pm – 8 pm on Wednesday January 16, 2019 followed by a funeral service at 11:00 a.m. on Thursday January 17, 2019. Pastor Kamron Oberlin will officiate. Kay’s final resting place will be in Millersburg at Riverside Cemetery. Those planning an expression of sympathy please consider a donation in memory of Kay to the Onaway Ambulance Equipment Fund. To plant a tree in memory of Kay L. Dempsey, please visit our Tribute Store. "Email Address" would like to share the life celebration of Kay L. Dempsey. Click on the "link" to go to share a favorite memory or leave a condolence message for the family.